AP Schools,Posts,Staff(Teachers) Rationalization Norms/Guidelines-Rc.4102: Commissioner of school education, AP, Rc.No.4102,Date:13/05/2016: School Education -Rationalization of Schools, Posts and Staff - Under various managements viz., Government, Zilla Parishad, Mandal Parishad proposals - Information called for -Reg. All the District Educational Officers are informed that the proposal for Rationalization of schools is submitted to Government after extensive consultations with Teachers M.L,Cs, Unions / Association representatives. The same is under consideration by the Government, before issue of Government Order. A copy of the Rationalization proposals submitted to Government is enclosed. 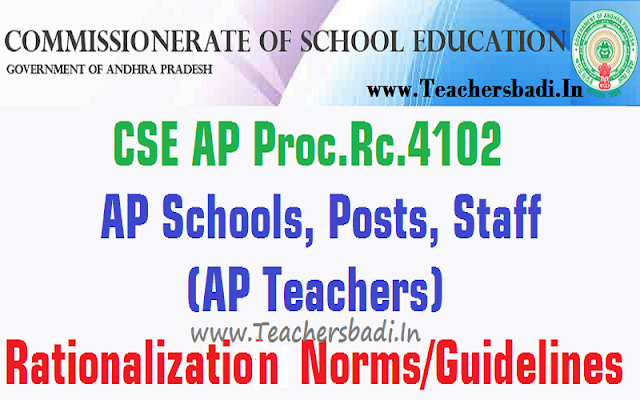 All the District Educational Officers are instructed to undertake the Rationalization exercise applying the proposed norms and submit potential scenario of school Rationalization in their district. Aadhar Seeded Integrated U-DISE Data with cut off date 31.03.2016 may be utilized for arriving at justification of staff. The District Educational Officers are further instructed to consult the Dy.E.Os / M.E.Os who will be aware about the field level situation. The District status report as per the norms of staff pattern proposed in Table I-A, I-B, II-A, II-B, Ill-A and III-B may be submitted by mail 14.05.2016, 5 P.M. positively. Please submit specially the following in their report. 7) Number of unviable High Schools. 9) Number of Success Schools that are to run with parallel Medium.